The waste water treatment sludge fired fluidized incinerator can dispose of city sludge cake, mixed plastics, waste rubbers, etc. 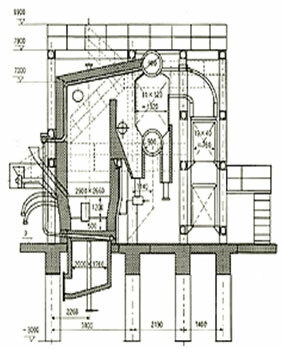 with waste water content 85% (waste oil or coal could be fed as auxiliary fuel) by using fluidized bed incineration. The secondary emission (SO2, NOx, CI2, HCI, etc) are easily controlled and meet to standard of international strict emission. Energy is recovered to produce steam/hot water or electricity refrigeration if related systems are added. After disposal, volume and weight of sludge cake are reduced greatly (dregs 10%-15%). This technology (Know-how) can dispose of sludge and wastes with waste content from 50% to 85%, quantities from 10t/d to 500t/d. The technology could be used to incinerate sewage sludge, coal sludge, lake or river sludge and municipal solid sludge, etc. Such incinerator with a disposal capacity of 65t/d has been exported to Korea. The disposal quantities (day) and analysis data (Primary & ultimate) of wastes or sludge, or submit their samples. The kind of auxiliary fuel. The usage of heat recovery.